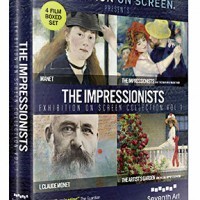 Four internationally celebrated films, first released in cinemas, and are now available together on this DVD. Enjoying exclusive access to a Royal Academy of Arts exhibition and behind-the-scenes at the show’s preparation this film is a fascinating close-up of Manet’s works; a detailed biography; and an exploration of 19th century Paris plus fascinating opinions of special guests, experts and contemporary artists. 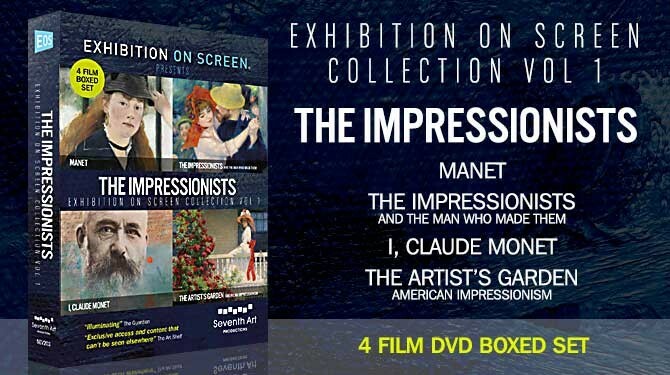 This, the most comprehensive film ever made about the Impressionists, focusses on an exhibition of paintings collected by 19th century Parisian Paul Durand-Ruel who supported this new wave of art. Degas, Manet, Monet, Renoir, Sisley, are among the painters he helped establish through his galleries in London, New York and Paris. Shot on location at the very spots where Monet painted, this film is a fresh and intimate cinematic exploration of some of the most loved and iconic scenes in western art. Monet’s letters provide new insights into the man behind the sun-drenched canvasses – perhaps the most influential painter of the 19th and early 20th centuries. Childe Hassam, William Merritt Chase and Philip Leslie Hale were celebrated artists belonging to the American impressionist movement. It’s a story closely tied to a love of gardens and a desire to preserve nature at a time of rapid urbanisation in America. This mesmerizing film is a feast for the eyes. Subtitles: English, Dutch, French, German. Subtitles: English, Dutch, French, German, Spanish, Japanese. Subtitles: English, Dutch, French, German, Spanish.